Florenz Edward Ziegfeld Jr. (March 21, 1867 – July 22, 1932), popularly known as Flo Ziegfeld, was an American Broadway impresario, notable for his series of theatrical revues, the Ziegfeld Follies (1907–1931), inspired by the Folies Bergère of Paris. He also produced the musical Show Boat. He was known as the "glorifier of the American girl". Ziegfeld is a member of the American Theater Hall of Fame. As a child Ziegfeld witnessed first-hand the Chicago fire of 1871. His father ran the Chicago Musical College and later opened a nightclub, the Trocadero, to obtain business from the 1893 World's Fair. 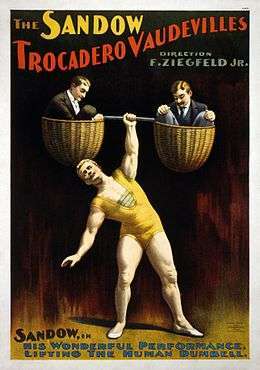 To help his father's nightclub succeed, Ziegfeld hired and managed the strongman, Eugen Sandow. During a trip to Europe, Ziegfeld came across a young Polish-French singer by the name of Anna Held. 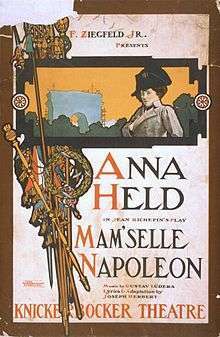 His promotion of Anna Held in America brought about her meteoric rise to national fame. It was Held who first suggested an American imitation of the Parisian Follies to Ziegfeld. Her success in a series of his Broadway shows, especially The Parisian Model (1906), was a major reason for his starting a series of lavish revues in 1907. Much of Held's popularity was due to Ziegfeld's creation of publicity stunts and rumors fed to the American press. Ziegfeld's stage spectaculars, known as the Ziegfeld Follies, began with Follies of 1907, which opened on July 7, 1907, and were produced annually until 1931. These extravaganzas, with elaborate costumes and sets, featured beauties chosen personally by Ziegfeld in production numbers choreographed to the works of prominent composers such as Irving Berlin, George Gershwin and Jerome Kern. The Ziegfeld Follies featured the famous Ziegfeld Girls, female chorus dancers who wore elaborate costumes and performed in synchronization. 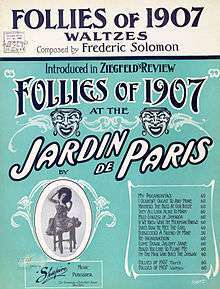 The Follies featured many performers who, though well known from previous work in other theatrical genres, achieved unique financial success and publicity with Ziegfeld. Included among these are Nora Bayes, Fanny Brice, Ruth Etting, W. C. Fields, Eddie Cantor, Marilyn Miller, Will Rogers, Bert Williams and Ann Pennington. However, Ziegfeld and actress Billie Burke were married April 11, 1914, after meeting at a party on New Year's Eve. They had one child, Patricia Ziegfeld Stephenson (1916–2008). The family lived on his estate in Hastings-on-Hudson, New York, and in Palm Beach, Florida. At a cost of $2.5 million, Ziegfeld built the 1600-seat Ziegfeld Theatre on the west side of Sixth Avenue between 54th and 55th Streets. Designed by Joseph Urban and Thomas W. Lamb, the auditorium was egg-shaped with the stage at the narrow end. A huge medieval-style mural, The Joy of Life, covered the walls and ceiling. To finance the construction, Ziegfeld borrowed from William Randolph Hearst, who took control of the theater after Ziegfeld's death. The Ziegfeld Theatre opened in February 1927 with Ziegfeld's production of Rio Rita, which ran for nearly 500 performances. This was followed by Show Boat, a great hit with a run of 572 performances. This musical about racial segregation was a collaboration between Ziegfeld, composer Jerome Kern, and designer Joseph Urban. The musical has been revived four times on Broadway, winning multiple Tony awards. The score features several classics such as "Ol' Man River" and "Can't Help Lovin' Dat Man". Ziegfeld lost much of his money in the stock market crash. In May 1932 he staged a revival of Show Boat that ran for six months—a hit, by Depression standards. That same year, he brought his Follies stars to CBS Radio with The Ziegfeld Follies of the Air. Ziegfeld died in Hollywood, California on July 22, 1932 from pleurisy, related to a previous lung infection. He had been in Los Angeles only a few days after moving from a New Mexico sanitarium. His death left Burke with substantial debts, driving her toward film acting to settle them. He and Burke are interred in Kensico Cemetery in Valhalla, New York. Ziegfeld was elected to the American Theatre Hall of Fame. Ziegfeld appears in a sound prologue to the 1929 film, Show Boat—a part-talkie based on Edna Ferber's 1926 novel, not the popular stage adaptation that was still playing on Broadway when the film was released. Universal Pictures originally made Show Boat as a silent, and obtained the rights to the popular Broadway score after the film was shot. 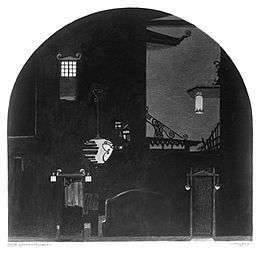 The 18-minute prologue is introduced by Ziegfeld and producer Carl Laemmle, and features excerpts from the stage production performed by cast members Jules Bledsoe, Tess Gardella, Helen Morgan and the Broadway chorus. :61 Two subsequent adaptations of Show Boat, in 1936 and 1951, were based on the stage musical. Marilyn Miller reprised one of her greatest stage successes in Sally (1929). Eddie Cantor reprised his popular Broadway role in Whoopee! (1930), which Ziegfeld himself produced with Samuel Goldwyn. Released by MGM ten years later, Ziegfeld Follies (1946) was an all-star revue that includes Powell in a cameo role as Ziegfeld. 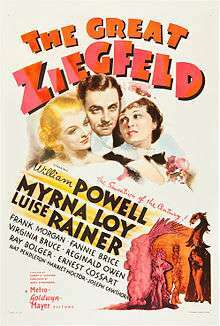 :228–229:201 A 1978 NBC-television film, Ziegfeld: The Man and His Women, stars Paul Shenar as Ziegfeld. Directed by Buzz Kulik, the three-hour biopic was nominated for seven Emmy Awards and received the award for Outstanding Cinematography (Gerald Finnerman). The Academy Film Archive houses the Florenz Ziegfeld-Billie Burke Collection. The collection consists primarily of home movies. Redniss, Lauren, Century Girl: 100 Years in the Life of Doris Eaton Travis, Last Living Star of the Ziegfeld Follies, New York, Harper Collins, 2006; ISBN 978-0-06-085333-4. 1 2 3 4 5 "Florenz Ziegfeld Dies in Hollywood After Long Illness". The New York Times. July 23, 1932. Retrieved 2009-02-19. 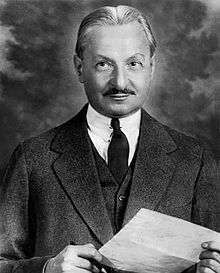 ↑ "Florenz Ziegfeld, March 21, 1867 – July 22, 1932". Find a Grave. Retrieved 2016-02-18. 1 2 3 4 Mordden, Ethan (2008). Ziegfeld: The Man Who Invented Show Business. New York: St. Martin's Press. ISBN 9781429951524. ↑ Hester, Heather. "Florenz Ziegfeld Jr.." In Immigrant Entrepreneurship: German-American Business Biographies, 1720 to the Present, vol. 4, edited by Jeffrey Fear. German Historical Institute. Last modified November 13, 2014. ↑ Eve Golden (reviewed by Margaret Van Dagens). "Book review, Anna Held And The Birth Of Ziegfeld's Broadway, New York Times, May 14, 2000. 1 2 3 "Anna Held Dies After Brave Fight". The New York Times. August 13, 1918. Retrieved 2016-02-13. 1 2 "Florenz Ziegfeld biography", pbs.org, accessed January 13, 2011. 1 2 Hanson, Nils (2011). Lillian Lorraine, The Life and Times of a Ziegfeld Diva. Jefferson, N.C.: McFarland & Company Publishers. ISBN 9780786464074. ↑ "Patricia Ziegfeld Stephenson, Daughter of Legendary Broadway Impresario". Jazz News. 2008-04-25. Retrieved 2008-05-11. ↑ Innes, C.D. "Chapter: Stage and Screen", Designing modern America: Broadway to Main Street, Yale University Press, 2005; ISBN 0-300-10804-4, pp. 60-62. ↑ "Theater Hall of Fame members". American Theater Hall of Fame. Retrieved 2016-02-18. ↑ "A Parlor Match". Internet Broadway Database. Retrieved 2016-02-14. 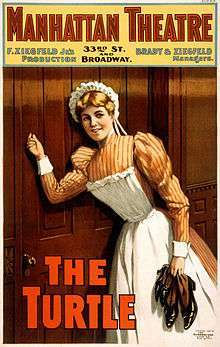 ↑ "The French Maid". Internet Broadway Database. Retrieved 2016-02-14. ↑ "Way Down East". Internet Broadway Database. Retrieved 2016-02-14. ↑ "The Turtle". Internet Broadway Database. Retrieved 2016-02-14. ↑ "Mlle. Fifi". Internet Broadway Database. Retrieved 2016-02-14. ↑ "The Manicure". Internet Broadway Database. Retrieved 2016-02-14. ↑ "Papa's Wife". Internet Broadway Database. Retrieved 2016-02-14. ↑ "The Little Duchess". Internet Broadway Database. Retrieved 2016-02-14. ↑ "Red Feather". Internet Broadway Database. Retrieved 2016-02-14. ↑ "Mam'selle Napoleon". Internet Broadway Database. Retrieved 2016-02-14. ↑ "Higgledy-Piggledy". Internet Broadway Database. Retrieved 2016-02-14. ↑ "A Parisian Model". Internet Broadway Database. Retrieved 2016-02-14. ↑ "Ziegfeld Follies of 1907". Internet Broadway Database. Retrieved 2016-02-14. ↑ "The Soul Kiss". Internet Broadway Database. Retrieved 2016-02-14. ↑ "Ziegfeld Follies of 1908". Internet Broadway Database. Retrieved 2016-02-14. ↑ "Miss Innocence". Internet Broadway Database. Retrieved 2016-02-14. ↑ "Ziegfeld Follies of 1909". Internet Broadway Database. Retrieved 2016-02-14. ↑ "Ziegfeld Follies of 1910". Internet Broadway Database. Retrieved 2016-02-14. ↑ "Ziegfeld Follies of 1911". Internet Broadway Database. Retrieved 2016-02-14. ↑ "Over the River". Internet Broadway Database. Retrieved 2016-02-14. ↑ "A Winsome Widow". Internet Broadway Database. Retrieved 2016-02-14. ↑ "Ziegfeld Follies of 1912". Internet Broadway Database. Retrieved 2016-02-14. ↑ "Ziegfeld Follies of 1913". Internet Broadway Database. Retrieved 2016-02-14. ↑ "Ziegfeld Follies of 1914". Internet Broadway Database. Retrieved 2016-02-14. ↑ "Ziegfeld Follies of 1915". Internet Broadway Database. Retrieved 2016-02-14. ↑ "Ziegfeld Follies of 1916". Internet Broadway Database. Retrieved 2016-02-14. 1 2 "The Century Girl". Internet Broadway Database. Retrieved 2016-02-14. ↑ "Ziegfeld Follies of 1917". Internet Broadway Database. Retrieved 2016-02-14. ↑ "The Rescuing Angel". Internet Broadway Database. Retrieved 2016-02-14. ↑ "Miss 1917". Internet Broadway Database. Retrieved 2016-02-15. ↑ "A Night in Spain". Internet Broadway Database. Retrieved 2016-02-15. ↑ "Ziegfeld Follies of 1918". Internet Broadway Database. Retrieved 2016-02-15. ↑ "Ziegfeld Midnight Frolic". Internet Broadway Database. Retrieved 2016-02-15. ↑ "By Pigeon Post". Internet Broadway Database. Retrieved 2016-02-15. ↑ "Ziegfeld Follies of 1919". Internet Broadway Database. Retrieved 2016-02-15. ↑ "Ziegfeld Nine O'Clock Review". Internet Broadway Database. Retrieved 2016-02-15. ↑ "Caesar's Wife". Internet Broadway Database. Retrieved 2016-02-15. ↑ "Elsie Janis and Her Gang". Internet Broadway Database. Retrieved 2016-02-15. ↑ "Ziegfeld Girls of 1920". Internet Broadway Database. Retrieved 2016-02-15. ↑ "Ziegfeld Follies of 1920". Internet Broadway Database. Retrieved 2016-02-15. ↑ "Sally". Internet Broadway Database. Retrieved 2016-02-15. ↑ "Ziegfeld Follies of 1921". Internet Broadway Database. Retrieved 2016-02-15. ↑ "The Intimate Strangers". Internet Broadway Database. Retrieved 2016-02-15. ↑ "Ziegfeld Follies of 1922". Internet Broadway Database. Retrieved 2016-02-15. ↑ "Rose Briar". Internet Broadway Database. Retrieved 2016-02-15. ↑ "Ziegfeld Follies of 1923". Internet Broadway Database. Retrieved 2016-02-15. ↑ "Kid Boots". Internet Broadway Database. Retrieved 2016-02-15. ↑ "Ziegfeld Follies of 1924". Internet Broadway Database. Retrieved 2016-02-15. ↑ "Annie Dear". Internet Broadway Database. Retrieved 2016-02-15. ↑ "Ziegfeld Follies of 1925". Internet Broadway Database. Retrieved 2016-02-15. ↑ "No Foolin'". Internet Broadway Database. Retrieved 2016-02-15. ↑ "Betsy". Internet Broadway Database. Retrieved 2016-02-15. ↑ "Rio Rita". Internet Broadway Database. Retrieved 2016-02-15. ↑ "Show Boat". Internet Broadway Database. Retrieved 2016-02-15. ↑ "Rosalie". Internet Broadway Database. Retrieved 2016-02-15. ↑ "The Three Musketeers". Internet Broadway Database. Retrieved 2016-02-15. ↑ "Whoopie!". Internet Broadway Database. Retrieved 2016-02-15. ↑ "Show Girl". Internet Broadway Database. Retrieved 2016-02-15. ↑ "Bitter Sweet". Internet Broadway Database. Retrieved 2016-02-15. ↑ "Smiles". Internet Broadway Database. Retrieved 2016-02-15. ↑ "Ziegfeld Follies of 1931". Internet Broadway Database. Retrieved 2016-02-15. ↑ "Hot-Cha!". Internet Broadway Database. Retrieved 2016-02-15. ↑ "Show Boat details". AFI Catalog of Feature Films. American Film Institute. Retrieved 2016-02-18. ↑ Hirschhorn, Clive (1985) . The Universal Story. New York: Crown Publishers. ISBN 0-7064-1873-5. ↑ "Show Boat". AFI Catalog of Feature Films. American Film Institute. Retrieved 2016-02-18. ↑ Jewell, Richard B.; Harbin, Vernon (1982). The RKO Story. New York: Arlington House. ISBN 0-517-54656-6. ↑ "Rio Rita details". AFI Catalog of Feature Films. American Film Institute. Retrieved 2016-02-18. ↑ "Sally". AFI Catalog of Feature Films. American Film Institute. Retrieved 2016-02-18. ↑ "Whoopee!". AFI Catalog of Feature Films. American Film Institute. Retrieved 2016-02-18. 1 2 Quirk, Lawrence J. (1986). The Complete Films of William Powell. New York: Citadel Press. ISBN 0-8065-0998-8. ↑ "The Great Ziegfeld". Academy Awards Database. Academy of Motion Picture Arts and Sciences. Retrieved 2016-02-18. ↑ "The Great Ziegfeld". AFI Catalog of Feature Films. American Film Institute. Retrieved 2016-02-18. 1 2 Eames, John Douglas (1982) . The MGM Story. New York: Crown Publishers. ISBN 9780517523896. ↑ Erickson, Hal. "Ziegfeld: The Man and His Women". AllMovie. Retrieved 2016-02-18. ↑ "Emmy Awards Search". Academy of Television Arts & Sciences. Retrieved 2016-02-18. ↑ "I'll See You in My Dreams". AFI Catalog of Feature Films. American Film Institute. Retrieved 2016-02-18. ↑ "The Story of Will Rogers". AFI Catalog of Feature Films. American Film Institute. Retrieved 2016-02-18. ↑ "The I Don't Care Girl". AFI Catalog of Feature Films. American Film Institute. Retrieved 2016-02-18. ↑ "The Eddie Cantor Story". AFI Catalog of Feature Films. American Film Institute. Retrieved 2016-02-18. ↑ "Deep in My Heart". AFI Catalog of Feature Films. American Film Institute. Retrieved 2016-02-18. ↑ "Funny Girl details". AFI Catalog of Feature Films. American Film Institute. Retrieved 2016-02-18. ↑ "Roger DeKoven Dies; Diverse Actor Was 81". The New York Times. January 29, 1988. Retrieved 2016-02-18. ↑ "Florenz Ziegfeld-Billie Burke Collection". Academy Film Archive. Retrieved July 5, 2016. Wikimedia Commons has media related to Florenz Ziegfeld, Jr..